The US Lags Behind on DenuclearizationLast year, more than 120 countries approved the Treaty on the Prohibition of Nuclear Weapons, which requires ratifying countries “never under any circumstances to develop, test, produce, manufacture, otherwise acquire, possess or stockpile nuclear weapons or other nuclear explosive devices.” It also prohibits the transfer of, use of, or threat to use nuclear weapons or nuclear explosive devices. During negotiations, in October 2016, North Korea had voted for the treaty. Once terrorists obtained the uranium, they would need only a small team of sympathetic engineers and physicists to build what is known as a gun-type nuclear bomb, like the one dropped on Hiroshima. A gun-type nuke uses traditional explosives to fire a slug of uranium through a tube directly into another chunk of uranium, fracturing huge numbers of atoms and unleashing a massive amount of energy. Compared to modern nuclear missiles, which are far more powerful and complex, constructing a crude gun-type nuke is fairly straightforward. ….. The last step in the process — smuggling the weapon into the United States — would be even easier. A ten-kiloton bomb, which would release as much energy as 10,000 tons of TNT, would be only seven feet long and weigh about 1,000 pounds. It would be simple to transport such a device to America aboard a container ship, just another unseen object in a giant metal box among millions of other metal boxes floating on the ocean. 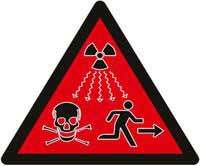 Even a moderate amount of shielding would be enough to hide its radioactive signature from most detectors at shipping hubs. 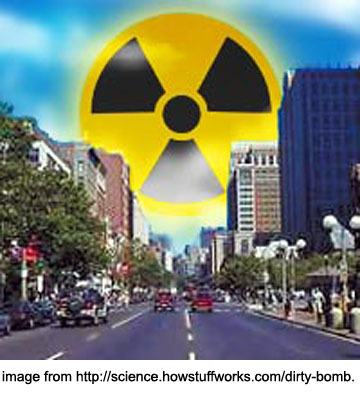 Given all the naturally radioactive items that frequently trigger false alarms — bananas, ceramics, Brazil nuts, pet deodorizers — a terrorist group could even bury the bomb in bags of Fresh Step or Tidy Cats to fool inspectors if a security sensor was tripped. In 1946, a senator asked J. Robert Oppenheimer, the physicist who played a key role in the Manhattan Project, what instrument he would use to detect a nuclear bomb smuggled into the United States. Oppenheimer’s answer: “A screwdriver.” Amazingly, our detection systems have still not caught up to this threat: One would essentially have to open and visually inspect every single crate and container arriving on America’s shores. Once the container ship reached a port like Newark, terrorists would have no trouble loading the concealed bomb into the back of an unassuming white van and driving it through the Lincoln Tunnel directly into Times Square. This was announced on Monday President of the Association of Citizens “Depleted Uranium” Sveto Nogo. The lawsuits will be filed individually, he explained. “NATO countries will be sued for pecuniary and non-pecuniary damages. We will launch lawsuits against five countries, and after the symposium, it will be decided which countries those will be,” Nogo said. “There has been an increasing number of cancer patients, and even babies are being born with cancer. We do not recognize ‘force majeure’, and as intellectuals we have no right to keep silent about it,” Nogo said. “The soldiers who had cancer and the families of the deceased have been afforded compensation ranging from 200,000 to 500,000 euros by a court in Italy. We will seek the same compensation for our citizens,” Aleksic said. “We appeal for an agreement and amicable resolution, because if Italian citizens have been paid compensation, I do not see any reason for our citizens not to receive it,” Aleksic pointed out. Domenico Leggero, a member of the Italian commission looking into the consequences of the use of depleted uranium, also spoke at the event to say that all judgments in Italy have been made in favor of the sick soldiers, while the country’s Ministry of Defense has been declared guilty. “In Italy there have been over 80 cases. The soldiers have been compensated,” Leggero said. He added that the harmful effect of depleted uranium on human health had been proven in Italy as early as in 1987. Baburin said that many people who defended the country have been convicted of crimes – unlike those who bombarded it. TEHRAN – Referring to recent statistics released by a Stockholm-based research institute, Foreign Minister Mohammad Javad Zarif said all proven nuclear warheads stationed in the Middle East are entirely owned by the Zionist regime of Israel. In a message in his Twitter account, Zarif denounced the Israeli regime for “howling incessantly” about Iran’s activities, while the regime itself owns all the 80 nuclear warheads in the Middle East. “There are at least 80 nuclear warheads stationed in the Middle East. None are in Iran; rather, they’re at the fingertips of a warmonger who howls incessantly about fabricated Iranian ‘ambitions’,” Zarif said. Donald Trump becomes fourth U.S. president to sign letter saying U.S. will not pressure Israel to forfeit its rumored nuclear capabilities, New Yorker reports • Obama aides failed to brief Trump officials on letter during transition, report says. Israel Hayom StaffIsrael has managed to secure a written pledge from four successive U.S. presidents to safeguard its presumed nuclear deterrent, The New Yorker magazine reported on Monday. The letter was later signed by President George W. Bush. But when President Barack Obama won office in 2008, Israel was concerned he would hold off on renewing the pledge. According to the report, part of the tensions then arose because the White House was not aware of the letters. “The very existence of the letters had been a closely held secret. Only a select group of senior American officials, in three previous administrations, knew of the letters,” the report said. “What they’re saying [is] they confirm our exposure could be linked to our cancer and our illnesses,” community activist Kim Visintine said. The Agency for Toxic Substances and Disease Registry assesses the risk of hazardous waste sites, among other tasks. It’s part of the Department of Health and Human Services and is based at the Centers for Disease Control and Prevention headquarters in Atlanta. Manhattan Project was stored in an open site close to the creek. Over years, that waste migrated into the dirt in the Coldwater Creek bed. A report from the Missouri Department of Health and Senior Services found an increased rate of certain types of cancer in the area around the creek. According to the federal agency’s report, the highest risk for exposure is in children and adults who lived near the creek in 1960s through the 1990s. “Our evaluation did find an increased risk of some cancer, especially for the past exposures, people who grew up in the area and played very often or frequently in or near the creek,” said Jill Dykin, an environmental health scientist for the agency. Dykin added the report can’t link individual people’s health problems with exposures, just draw a connection to the risk. For Visintine, that’s enough. The former north St. Louis County resident and the co-founder of the group Coldwater Creek – Just the Facts said the report confirms years of suspicions. She said the federal acknowledgement could pave the way for residents to receive relief from the government through the Radiation Exposure Compensation Act, which provides compensation to people whose cancers can be linked to nuclear weapons tests. “The big thing you’re now eligible for these grants and funds for your community screening clinics, for insurance,” Visintine said. “To even get to that point, to pursue legislation, you have to have the CDC acknowledge there was exposure. Four nationally known scientists are recommending new testing at a popular Los Angeles-area Jewish camp to determine if contaminants at a nearby former nuclear testing site have posed health risks to past and current campers, NBC Los Angeles reported. The scientists independently reached that conclusion after reviewing various reports of past testing at Camp Alonim and the land it sits on, the Brandeis-Bardin campus, owned by the American Jewish University. The camp is located just below Santa Susana Field Laboratory, which for decades hosted rocket and experimental nuclear reactor testing. The laboratory has long been closed but is still awaiting a full cleanup, according to NBC. Both AJU and state toxics regulators say the land is safe. “If you looked at this historically and said, ‘Could being at the camp have led to radiation exposure’ the answer is yes,” said Dr. Jonathan Samet, an internationally known radiation expert and dean of the Colorado School of Public Health, one of the scientists interviewed. Among the key findings from the two-year investigation are that the test results cited by the camp and state regulators are either too old or too inconclusive to definitely say whether children are safe from contamination from the Field Lab. The article also claimed a 2016 study paid for by the camp’s owner, to investigate concerns about contamination, is flawed. AJU also says the camp has no history of growing food for children to eat in the potentially toxic soil, a claim challenged by past staff. The article originally was planned to appear in the Los Angeles Jewish Journal, but according to NBC, the Jewish Journal’s new publisher declined to publish the story. ERYN MACDONALD, ANALYST | JUNE 18, 2018, The Trump administration’s Nuclear Posture Review (NPR), released in February of this year, calls attention to the composition of the US nuclear arsenal and its adequacy as a deterrent. The NPRcalls for a new lower-yield submarine-launched nuclear warhead, arguing that it is needed to “counter any mistaken perception of an exploitable ‘gap’ in U.S. regional deterrence capabilities.” We decided to put together the chart in Fig. 1 to illustrate the range of nuclear weapons alreadyavailable in the US arsenal. Lots of conservatives hate Trump’s coal and nuclear bailout — that’s a big political problem, The Hill, BY SILVIO MARCACCI, — 06/19/18 Conservative opposition to EPA Administrator Scott Pruitt has dominated headlines — losing stalwarts like Sen. Jim Inhofe (R-Okla.) and Laura Ingraham stings. However, the Trump administration’s bigger political problem among conservatives could be its controversial proposal to spend billions on a coal and nuclear bailout. After all, President Trump can simply fire Pruitt: problem solved. But enacting his bailout policy would roil U.S. power markets while alienating a growing number of conservatives and costing consumers billions during his re-election campaign — much tougher mistakes to fix. It’s no surprise environmental groups and clean energy groups are fightingTrump’s bailout — it would keep coal, the dirtiest available electricity source, on life support. What’s shocking here is the withering fire his bailout proposal drew from conservative media outlets, conservative analysts, and even Trump’s conservative appointees. Conservatives are opposing the bailout’s economic impacts, which could cost U.S. consumers at least $11.8 billion annually according to Energy Innovation’s analysis, or up to $34 billion per year, according to theNuclear Information and Resource Service. Trump’s bailout would hike consumer bills by guaranteeing payments to coal and nuclear plants that have either been shutting down or are in danger of closing because they cost more to run than renewable energy or natural gas, instead of letting utilities make their own decisions. Americans for Prosperity weighed in on that point via Twitter. Those bailout billions would be unevenly distributed: In regional U.S. power markets, just five companies own the majority of uneconomic plants, and they’d get the overwhelming majority of federal subsidies. ”Mandating that grid operators buy more expensive coal and nuclear power would raise consumer prices and could reduce natural gas production that has been a boon to many states,” wrote the Wall Street Journal editorial board. Hiking power costs for businesses and consumers could inflict a grievous political injury. These billions in higher electricity costs would hit consumer pocketbooks in battleground states (Iowa, Pennsylvania, Ohio, Wisconsin, Michigan, Virginia) located within the affected U.S. power markets. “It is a ridiculously bad idea. Its consequences will be bad for Trump and, in the long run, bad for coal as well,” wrote the Washington Examiner editorial board. “This unprecedented government interference in energy markets will harm the economy under Trump’s watch.”…….. Proposing policies that risk wide-ranging lawsuits is problematic for any president, but this administration has shown it doesn’t care about those typical concerns. But when even conservative groups and conservative media outlets agree with their liberal counterparts, Trump has a bigger problem — and a potential re-election wedge issue — on his hands. He had pain in his kidneys and went to the doctor and they sent him to an oncologist who said he had cancer from radiation exposure,” she said in a phone interview Monday from her home in Pensacola, Fla.